In humans, there are typically four glands situated as shown in the illustration; however, the number varies between three and six, with four appearing about 80% of the time. Variations in the positioning of the glands along the craniocaudal axis occur but, excepting parathyroid III which may occasionally be found upon the anterior surface of the trachea, the relation to the posterior surface of the thyroid is rarely lost. 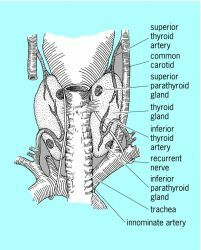 A paired endocrine organ located within, on, or near the thyroid gland in the neck region of all vertebrates except fishes. There was no family history of thyroid and parathyroid diseases. Incorrect resection rate of parathyroid gland and temporary hypoparathyroidism: The incorrect resection rate of parathyroid gland in the methylene blue group (16. The BRAF V600E and parathyroid classifiers were designed to further reduce unnecessary surgeries in thyroid cancer diagnosis and guide appropriate treatment for patients whose thyroid nodules are likely cancerous. Ectopic locations of parathyroid glands are believed to arise from aberrant migration during embryogenesis. Therefore, to locate the parathyroid gland(s) and identify any abnormalities, we applied several imaging techniques, including cervical ultrasound, contrast computed tomography (CT) of the neck and chest [Figure 1]a, and [sup]99m Tc-Sestamibi scan. The parathyroid hormone level was measured and was found to be markedly elevated at 10. Parathyroid surgery in familial hyperparathyroid disorders. Asymptomatic parathyroid adenomas are usually diagnosed when a higher than normal calcium level is found in a routine blood test. This was a parathyroid nodular lesion in 3 patients. Although it is known to be higher in PCs than adenomas, no cut-off value providing a definite benign-malignant differentiation has been identified in parathyroid tumors. It occurs when loss of function of the parathyroid glands causes the body to secrete abnormally low levels of parathyroid hormone, which helps regulate calcium and phosphorus levels in the body. Keywords: Vitamin D deficiency, P1NP, Beta-Crosslaps, Parathyroid hormone.